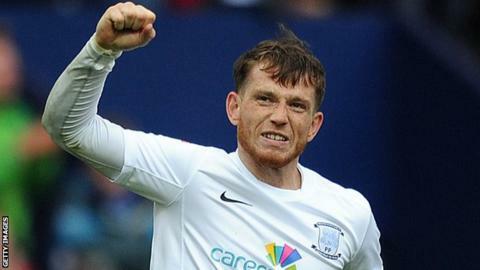 Preston maintained their promotion push with a win against 10-man Chesterfield. The Spireites got off to a disastrous start when Sam Hird was shown a straight red card only two minutes in, after he was adjudged to have fouled Joe Garner who was through on goal. Garner then made the man advantage count as he nodded in Kevin Davies's right-wing cross on the half-hour mark. Former Watford striker Garner bundled in a late second after Paul Huntington's header hit the post. The winning margin could have been even greater for the visitors, but home goalkeeper Tommy Lee kept the score down as he saved Scott Laird's 25-yard strike and Garner's volley. Byron Harrison spurned the host's best chance when he blazed the ball over the bar on the stretch from six yards. The victory for Simon Grayson's side sees them close the gap to four points behind second-placed Swindon, while Chesterfield drop out of the play-off zone to seventh. Match ends, Chesterfield 0, Preston North End 2. Second Half ends, Chesterfield 0, Preston North End 2. Corner, Chesterfield. Conceded by John Welsh. Hand ball by Sylvain Ebanks-Blake (Preston North End). Foul by Jay O'Shea (Chesterfield). Paul Gallagher (Preston North End) wins a free kick on the right wing. Substitution, Preston North End. Neil Kilkenny replaces Daniel Johnson. Corner, Preston North End. Conceded by Charlie Raglan. Corner, Chesterfield. Conceded by Chris Humphrey. Substitution, Preston North End. Sylvain Ebanks-Blake replaces Joe Garner. Goal! Chesterfield 0, Preston North End 2. Joe Garner (Preston North End) header from the centre of the box to the centre of the goal. Corner, Preston North End. Conceded by Thomas Lee. Corner, Preston North End. Conceded by Tendayi Darikwa. Substitution, Preston North End. Chris Humphrey replaces Scott Wiseman. Substitution, Chesterfield. Emmanuel Dieseruvwe replaces Caolan Lavery. Substitution, Chesterfield. Mark Duffy replaces Byron Harrison. Attempt saved. Joe Garner (Preston North End) header from the centre of the box is saved in the centre of the goal. Attempt missed. Byron Harrison (Chesterfield) right footed shot from the centre of the box is too high. Foul by Byron Harrison (Chesterfield). Tom Clarke (Preston North End) wins a free kick in the defensive half. Attempt saved. Joe Garner (Preston North End) right footed shot from the centre of the box is saved in the bottom right corner. Byron Harrison (Chesterfield) hits the left post with a header from the centre of the box. John Welsh (Preston North End) wins a free kick in the attacking half. Byron Harrison (Chesterfield) wins a free kick in the defensive half. Foul by Paul Huntington (Preston North End). Attempt missed. Scott Wiseman (Preston North End) right footed shot from outside the box is too high. Attempt saved. Sam Morsy (Chesterfield) right footed shot from outside the box is saved in the top centre of the goal. Foul by Ian Evatt (Chesterfield). Kevin Davies (Preston North End) wins a free kick on the right wing. Second Half begins Chesterfield 0, Preston North End 1. First Half ends, Chesterfield 0, Preston North End 1. Attempt missed. Jay O'Shea (Chesterfield) header from the centre of the box is too high. Corner, Preston North End. Conceded by Ian Evatt. Jimmy Ryan (Chesterfield) is shown the yellow card.